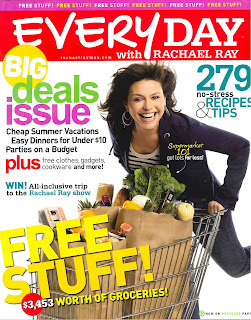 The May 2009 issue of Every Day with Rachael Ray is a doozy. The big, bold, yellow text saying "Free Stuff" refers to the magazines Big Deals Sweepstakes. You can enter to win every week from April 13 through June 7. If you're looking to save a little money, check out the $10 Spot recipes for Veggie-Loaded Spicy Peanut Noodles, which I already added to the list of recipes I plan on trying (located in the left hand sidebar), Biscuit-Crusted Sausage-Egg Pie, Chicken Fajita Salad with Poblano-Buttermilk Dressing, Roasted Tomatoes with Shrimp-and-Garlic-Bread Stuffing, and Beef-and-Portobello Minestroganoff. In the No-Recipe Zone, Editor-in-chief Silvana Nardone shares her recipe for mega-meatball subs. Daisy Martinez's Mucho Gusto column offers a recipe for the exotic-sounding Tamarind-Glazed Chicken Thighs. I love the section of the magazine where you add a few ingredients to the Every Day Kitchen to create some great meals. This time, add mango, brie and swordfish to your shopping list to create Mango Salsa with Chips, Coconut Mango Chicken with Black Beans, Swordfish with Pineapple Relish, Grilled Brie and Fig Sandwiches, and Fruit-and-Brie Quesadillas.